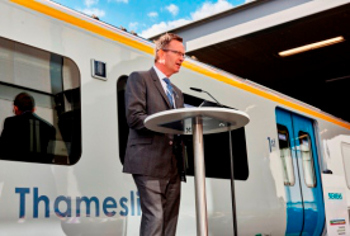 The chief executive of Govia Thameslink Railway (GTR) has resigned after weeks of delays and cancellations following the introduction of a new timetable and years of poor service on its Southern trains. GTR introduced a new timetable on 20 May, under which the time of every one of its trains changed. However this resulted in significant disruption, particularly on Thameslink and Great Northern services. Even this week, only around 85% of trains on the franchise arrived as planned (within five or 10 minutes of scheduled time), with around 5% of trains cancelled or significantly late. The Go-Ahead Group, which runs the GTR franchise, announced on Friday that Mr Horton had resigned but would remain in his post for a short period ‘to oversee the development of a temporary timetable to address recent disruption to services’. It added that his successor will be announced ‘in due course’. Mr Horton said: ‘I recognise that passengers have been hugely frustrated at the significant disruption caused by the introduction of new timetables. It is the right time to hand leadership of GTR to a new pair of hands. Go-Ahead group chief executive David Brown said: ‘I would like to thank Charles for his hard work with Govia for the past 15 years. ‘Under often challenging conditions, he has built a team to deliver the largest railway change programme for decades, on a franchise that is not only the UK's biggest, but which has also seen the highest passenger growth. Mr Horton’s resignation has been welcomed by both passenger groups and the RMT rail union, which has been engaged in a long-running dispute with GTR over the role of guards on Southern trains. RMT general secretary Mick Cash said: ‘Mr Horton may now have gone but the rotten franchise he was steering remains in place and no change at the top will alter that. This whole basket case operation is a failure on every level.